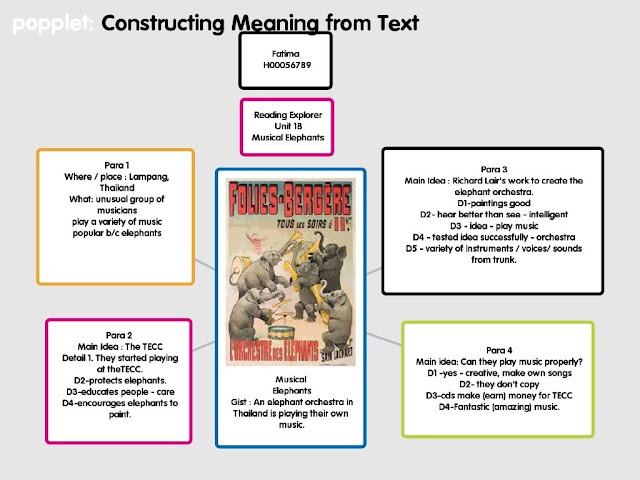 Popplet is a great tool to improve reading comprehension by focusing on the key skills of deconstructing main ideas of text, paragraphs and supporting details. By unpacking and summarizing the text students can compare with a Popplet you have made to ascertain their level of understanding. Students work in pairs , one with the text on the screen and the other with the Popplet App. They work collaboratively to deconstruct the text speaking English. You can challenge learners to find synonyms to summarize the text. The visualization is so powerful they can answer many comprehension questions without returning to the text as they are no longer reading superficially. Reading is a cognitively difficult task as you must retain the ideas of the text and then input more information in the form of reading the questions . Many second language learners struggle with these two short term memory tasks as their vocabulary proficiency may be inadequate to retain or map the information in their second language compared to their first language . Mind mapping uses the right side of the brain to map spatial visual connections and concepts. A visual frame is provided to hang the ideas and details. I have noticed a rapid change in their reading proficiency. They are all "at risk" and were below their expected level and had failed the reading course last semester. Now the average % for their reading tests is above 70 %. Forget the number, they are now different students brimming with self confidence and engaged. The greatest difference is their level of persistence and extended attention span when reading in their second language using an IPad. The use of the mind mapping App for reading was rapidly adopted by learners. Their reflections referred often to the fact they didn't realize how deeply they needed to understand the text to answer the questions. It is also a great tool for me to instantly visualize the students understanding of the text and provide immediate intervention as they process the text. There are many tasks that follow from this activity. One of my favorites is to make a screen capture in a Screencasting App such as Educreations or Screen Chomp and pairs of students retell the text . They take turns with their partner actively listening and assisting in reformulating the language. 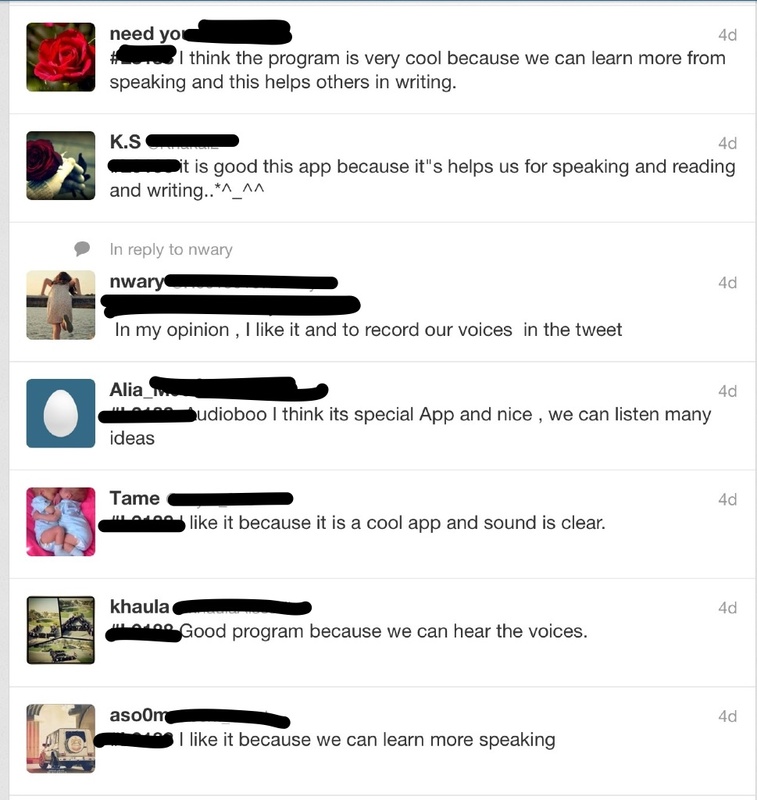 If they tweet their Educateations screencast across to another team, the team can transcribe their spoken text , peer edit and publish their final text summaries. Traditional reading and writing have to change and assessment needs to rapidly change. 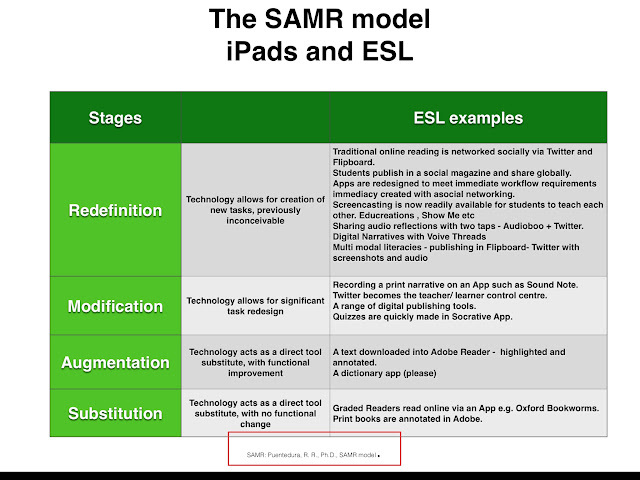 Students need experience in new literacies required for the 21st century and ESL assessment needs to be overhauled to mirror the demands of new multi-modal literacies. 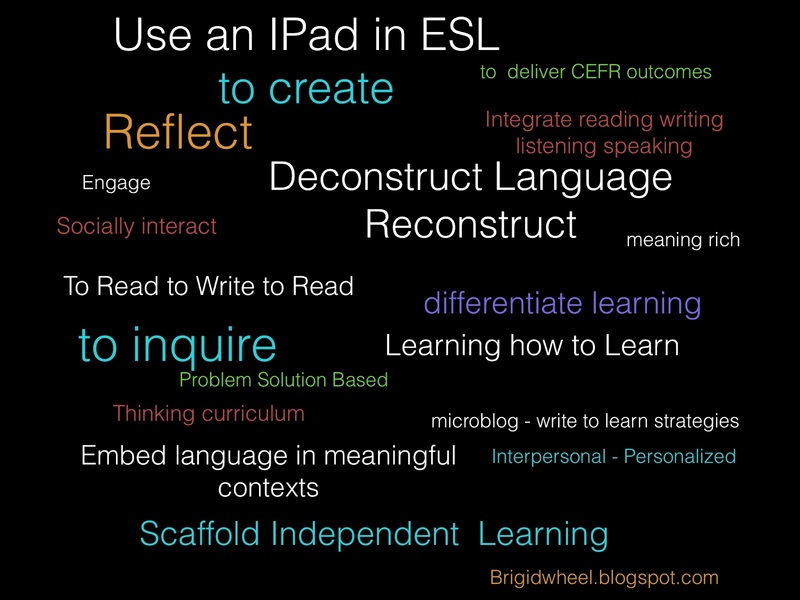 How do we capture the past for the future with new literacies available in the IPad ? We transform learning by thinking of new ways of creating and producing language in a meaningful context. Some ESL teachers love testing discrete grammar points. Is this what language proficiency is about ? It is more meaningful for students to use a range of past tense structures to communicate what is important to their lives. Personalizing learning this week, we focused on the UAE National Day. 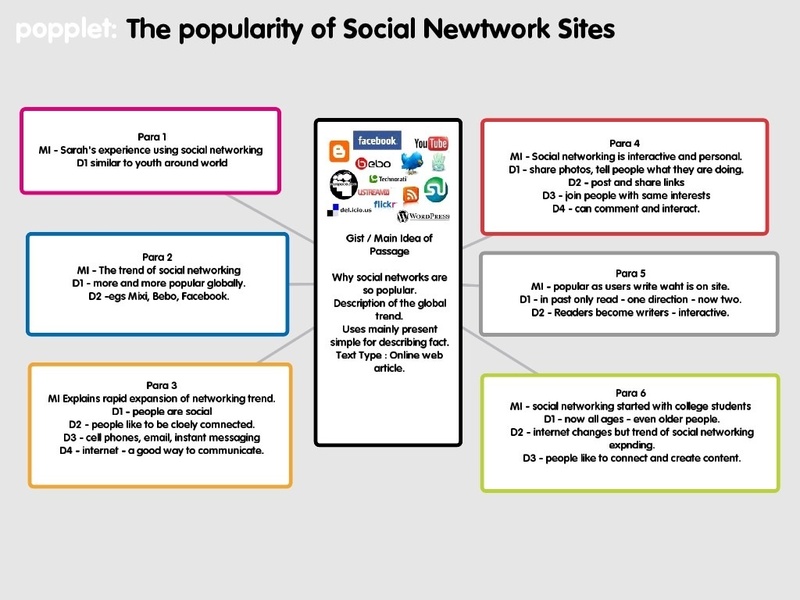 This new world is one of digitally connected Emirati citizens, building knowledge collaboratively and sharing with the world.. Students will not be filling in discrete gramnar gap fills in their future. They will need to communicate effectively in their second language. -The sound quality and 3 minute recording length. -The ability to share on social media such as Twitter. - Can embed an image. 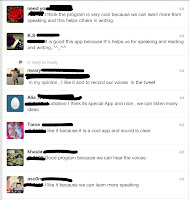 Task 1 - Students explored different Apps for sound recordings such as Soundfiles, but we focused on workflow and how we could share our recordings with Twitter. 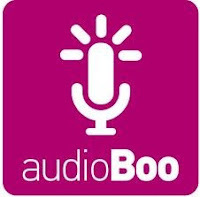 We found Audioboo. Task 2 - Students discussed and tweeted their views of Audioboo and its use generally to improve language skills. Task 3 - We discussed the meaning of National and the stories the students know of the past and the importance of documenting history for future generations. 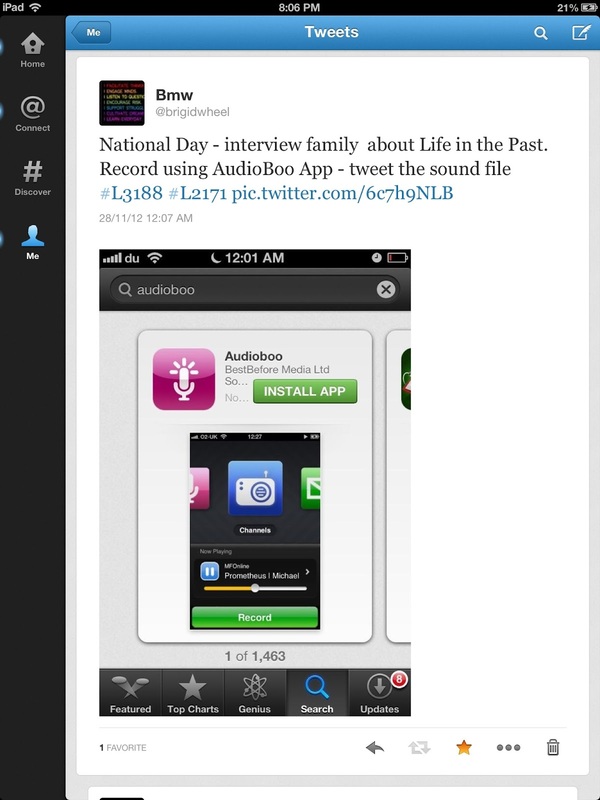 Task 5 - Students record National Day Narratives and tweet their Audioboos. Task 6 - Transcribe in Pages . Peer edit and revise. Task 7 - Screen capture with images - tweet and add to Flipboard and Evernote. Task 8 - Write to Read - students read , listen comment and retweet.